Red Alert siren sounds again after rocket barrage from Gaza injures 2. IAF strikes 12 targets. IDF fighter jets targeted 12 terror sites in the Gaza Strip Wednesday evening, including a tunnel-part and concrete factory, an offensive maritime terror tunnel shaft along the coast and several terror sites in military compounds throughout the Gaza Strip, among them rocket manufacturing facilities and a central logistical military complex. The IDF views Hamas' terror activity with great severity and is prepared for a wide variety of scenarios while continuing to fulfill its mission to defend Israeli civilians. Eight rockets were fired in the initial barrage, injuring two people, including a 13-year-old boy. Two of the rockets were intercepted by the Iron Dome missile defense system. One rocket struck a house, injuring a 34-year-old man. 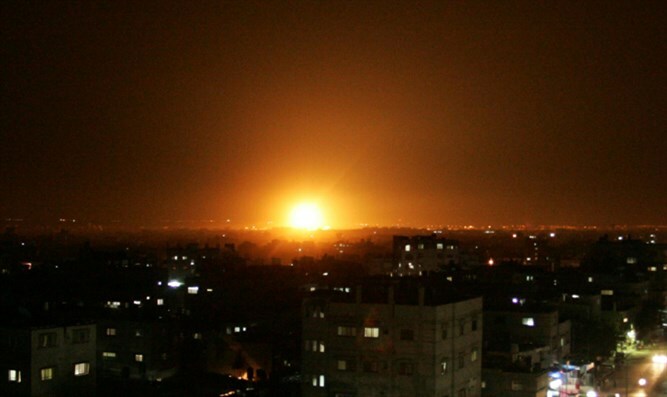 The Red Alert siren sounded several times following the initial barrage, possibly indicating the launching of more rockets from Gaza. The IDF announced the reinforcement of the Gaza division Wednesday in response to threats from the Hamas terrorist organization. Hamas released a statement in response to an Israeli airstrike which killed two terrorists Tuesday afternoon. In the statement, Hamas warned that "Israel will not be able to sleep at night. Their attack will not pass without them paying a price."